Battle scars, water marks and dirt from many trails. 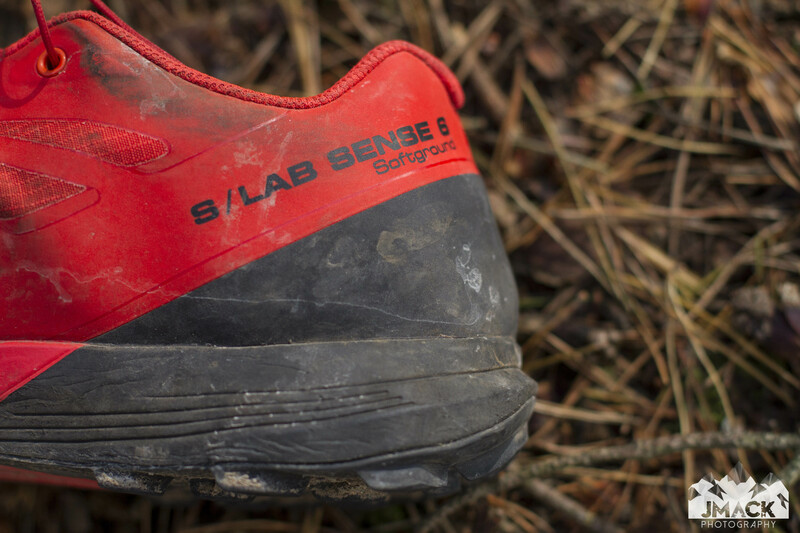 Salomon’s S/LAB Sense 6 SG are aimed at the those days where the trail is loose and the going is fast. They aren’t for plodding or holding back, designed for those looking to push their limits and compete for every meter. My pair of Sense 6 SG’s or Soft Grounds, have sunk their teeth into a variety of trails, from local sand and mud, to the rocky flanks of Annecy, right to the soft off trail fells of the Lake District. They wear their scars with pride, with chalk and light sands coating the distinctive black and red upper material, whilst a definitive salt mark recounts many a session completed. Much like the Sense 5 Ultra, the Sense 6 SG are light. The uppers really have little to them, held together with welded overlays and a lightly reinforced toe rand to protect from rock strikes. The upper mesh is anti debris and does a good job keeping crud out, while the combination of EndoFit™ and SensiFit™ to secure your foot. Much like their Sense 5/6 Ultra cousins, they are comfortable enough to run sock free. The Quicklace System works just as well as on the Sense Ride and provides quick and accurate lacing. Despite the stripped backed nature of the materials used across the upper, all have worn well and remain locked in place once under tension. In the toe box, there is a enough room for splaying, but if you’re looking to sink your toes wide, this is a precise shoe. The front contains a thin extra rand from protection against rock strikes and I was fortunate not to need to use this on the trail. The best way I can describe the fit is like a glove or a second skin. When I first wore the SG’s, it was for a simple walk up the road to the local shops, and I found them a little tight near the top of the laces. However, after this initial break in period, all of a mile, the upper appears to have moulded to my shape with every movement and now they are one of the comfiest shoes I’ve worn. As a final note on the upper, the heel cup is the most substantial part. It holds its shape, provides a secure lock/grip and though appearing higher when compared to the remainder of the shoe, is low profile. Now you’ve had a reasonable chance to look at my grubby shoes, I will say I have not washed them once. I’ve saturated them on wet fell side, but seldom have they got to a point of sheer mingingness….. trust me, it’s a real word, honest. They clearly breath well. As light as they are at 225g, it’s the comfort that is the real stand out feature. The sock liner has a Die Cut EVA foam element for the initial cushion when pressure is applied, which is backed up with a dual density compressed EVA and Energy Cell+ midsole. The dual densities soak up a lot of shock, while the Energy Cell provides energy return with every strike. For me, the SG’s come alive the more you push them. I prefer running in them when my legs are fresh and my stride is efficient. With speed comes reward. But I know the main reason you are looking is for the grip. They don’t have the grip of Speed’s or MudClaw‘s, but they allow you to run a variety of trail conditions without real detriment for speed or nimbleness. Now, my pair have had some good miles. The above is my right shoe and you can can clearly see how I strike on the right edge, where wear is clearly visible. The sole is constructed from Salomon’s Premium Wet Traction Contragrip®. Bombing up and down Mont Veyrier, outside Salomon’s global HQ in Annecy, the grip was relentless on dry and dusty trails, sticking to rock like quick bond adhesive. It was when I wore them shooting Mountain Fuel Billy Bland Challenge, that I got to take them off trail, on the fells between Honsitor Mine and Great Gable. Scrambling on damp rock, true grassy fell and muddy trail, they took everything I found under my feet in their stride and were a revelation. I wasn’t expecting them to grip like they did, especially on the grassy sections, where deeper lugs would normally be worn. This grip and comfort manifested to wearing them at many photo jobs as well as runs, and its the photo jobs that may have played a role in the wear on the sole… that and running 2 miles on pavements to local trails each time. The wide spacing of the lugs allows for efficient self cleaning of mud and debris, the heel’s lugs really help for breaking on descents and keeping control. To round the shoe off, the chasis has Profeel film which engages during the transition, linking the toe to the heel and providing stability. Well, that’s what Salomon say, the reality….. for a minimal shoe, with a 4mm drop and light elements, I do feel it provides a good level of support. It’s surprising, in a good way. All in all, the Salomon S/LAB Sense 6 SG has been a great shoe to test on a variety of trails and conditions. Salomon position it as a race shoe and given it’s price of £150 and the wear of the lugs, as much as I would happily wear this for a lot of my runs, keeping it to specific sessions or indeed races will get the most out of it. My only gripe is the lug wear, however, this always comes down to how you use them and if Salomon were to increase their durability, would it be at the loss of grip in the compound? It’s ultra light, nimble and surprisingly comfy, given the first two characteristics. It’s a shoe that warrants speed, a tool that reacts best when your head is down and your heart rate is high. The Salomon S/LAB Sense 6 SG was provided for review by Salomon – This is not a paid review or advertisement.